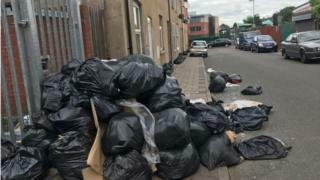 A "pay-as-you-throw" system for household rubbish should be introduced by 2030, one of the UK's biggest waste firms has said. Suez said weighing domestic waste with microchip technology in bins would help drive a revolution in recycling. The firm says that all packaging sold in the UK should have to be 50% recycled by 2025. A YouGov poll for the firm also found that Britons cite fast food packaging as the main cause of litter. The report by Suez, which employs more than 5,000 people in the UK and handles 10 million tonnes of waste a year, also calls for widespread refundable deposit schemes for packaging, especially for bottles and cans. The company's UK chief executive, David Palmer-Jones, said that more efficient recycling would cut council taxes waste collection bills. He said: "We believe innovative new systems will arise to capture, recycle, re-use and re-form materials if packaging manufacturers are required by law to have 50% minimum recycled content in their products and adhere to common design standards. The Suez report also said there should be a tax on using new or "virgin" materials for packaging - but not on recycled materials. Better design of packaging would make it easier to recycle, and targets should be set to halve food waste by 2030, Suez said. The call comes as a poll reveals that almost a quarter of people feel sandwich packaging or fast food containers are the main cause of litter, while almost a fifth (18%) think crisp packets and sweet wrappers are most to blame. And one in seven (14%) thought plastic bottles were the main problem, the YouGov poll found.